What’s your imagination of a perfect holiday in some off-the-beaten-track Isaan province? Plenty of activities to do and attractions to see during the day? Cheap and authentic local cuisine? Nice places to have a beer at night and maybe find some nice female company? Friendly and calm local people? And all that without being anything like touristic or overrun? Then you’ll love Nong Khai. Situated at the very northern tip of Isaan, the town of the same name is home of the most frequented land border between Thailand and Laos just before the famous Thai Lao Friendship Bridge over the Mekong River. 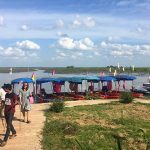 There are thousands of people driving through Nong Khai while completely ignoring its unique charm and the mix of Isaan and Lao ways of life. Last month I started my latest 2 week trip around Isaan right up in Nong Khai and it’s been a real pleasure to explore the different highlights of this province during the day on my rental motorbike (only 200 Baht per 24 hours, there’s a shop right opposite the hospital) and of course also checking out the nightlife and girls scene after sunset. It’s no surprise that the closer you come to the Mekong River Promenade the more businesses you will find and that includes not only girly bars and happy ending massage salons but obviously also plenty of scenic restaurants with splendid views of the Mekong. It’s one of the quintessential experiences in Nong Khai to enjoy a sunset dinner with your friend (or date) – preferably a fresh Bla Pao Fish (ปลาเผา) from the river or some Lao style Lab Moo (ลาบหมู). I’ve marked the exact spot of this picture on the map below. Before or after your dinner you may want to do like the locals and have a relaxed walk along the Mekong River Promenade. There’s also one landmark that you can see in the picture: The impressive Naga Statue. You can also rent a bicycle and ride along the new bike path leading all along the River Promenade for about 2km. 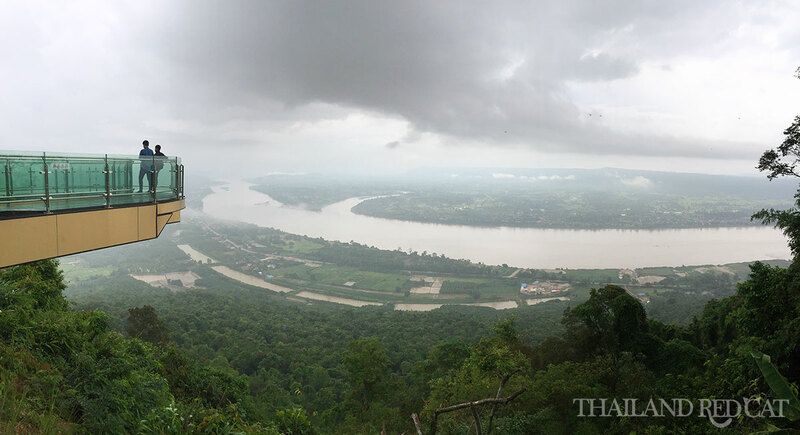 The absolute highlight and most famous attraction in Nong Khai: The 16m long and U-shaped Glass Sky Walk with fantastic views over Thailand, the Mekong River and Laos. It’s 78km west of town so it will take you about 2 hours to drive there with your bike (yes, not always the best road conditions but still quite a scenic drive). There’s one more tourist attraction on the way just 13km before the Sky Walk: Than Thong Waterfall. 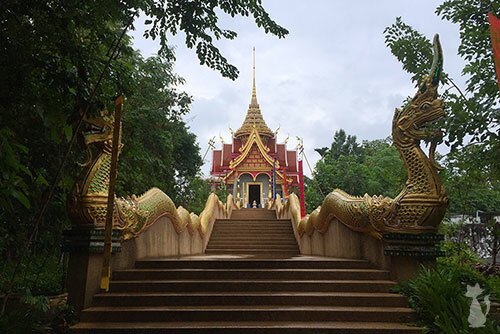 There is no admission fee to both places (yet) and there’s also a temple right behind the glass deck called Wat Pa Dak Suea (วัดผาตากเสื้อ), see the picture. I’m always a little reluctant to include temples or temple complexes in my highlights, because some of you guys may think “they all look the same and I only need to see the Grand Palace in Bangkok“. The Sala Keoku is quite different though. It’s not exactly a temple anyway but a park full of Buddhist and Hindu Statues. It’s extremely impressive to walk around the areal and look up to the massive Buddha statues, some of them higher than 25m! One of the biggest eye catches is definitely the 7-headed Naga Statue that protects the meditating Buddha underneath it. Make sure you walk all the way to the back where you’ll find smaller sculptures illustrating the wheel of life – the karmic cycle of birth to death. 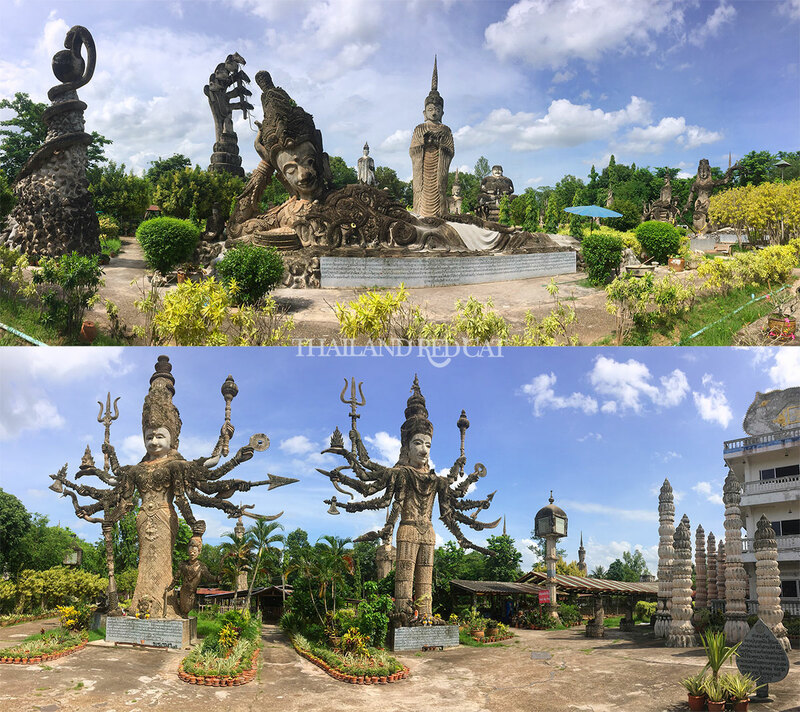 The Sala Keoku Sculptures Park is located just about 4km from downtown Nong Khai off the main road 212. The admission fee is 20 Baht for both Thais and foreigners and 10 Baht for babies. I didn’t really expect much when I rode down on my bike to the Nong Khai Aquarium on my last day. But the surprise was quite big when I discovered one of the nicest and well maintained aquariums I have seen in Thailand. They have plenty of fish, mostly from the Mekong River including several giant catfish. The highlight there and most picturesque spot is the walk through tunnel with countless of fish above and beside you. You’ll see a lot of couples there out on a date. 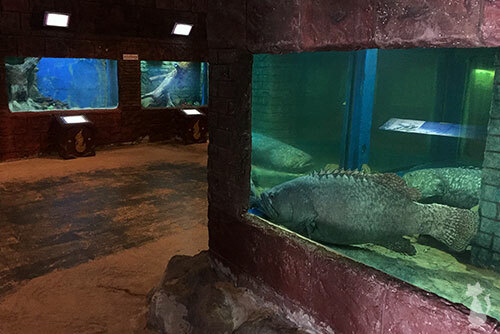 The Nong Khai Aquarium is situated within the grounds of the Nong Khai University about 10km south of town. The admission fee is 100 Baht for foreigners and 50 Baht for Thais. This is one of the few places where I paid the Thai price upon showing my Thai Driving License. 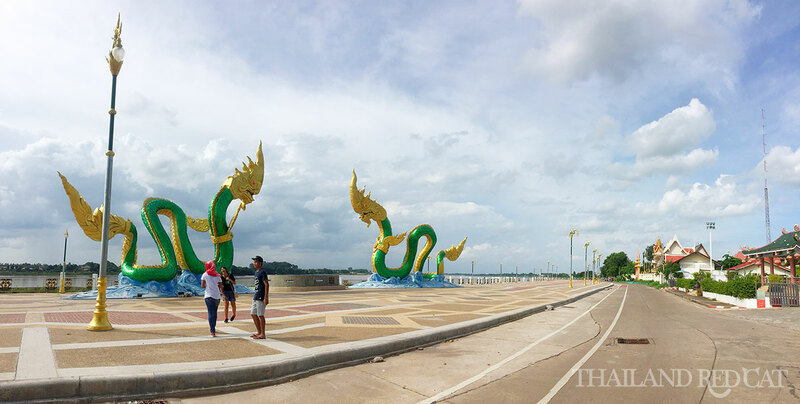 Nong Thin Park is the biggest public park in Nong Khai and very popular among the local Thais to come in the late afternoon after work or study when the hottest time of the day is over. They come to relax, take walks around or buy snacks like a cool coconut for 30 Baht. They also got a fine bike and running path leading all around the park (caution: one way). 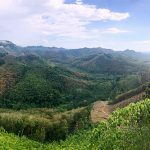 All in all I think 4 or maximum 5 nights are just fine to spend up in Nong Khai in order to see all the attractions on this list and to really get a feel for this small and calm province on the border to Laos.